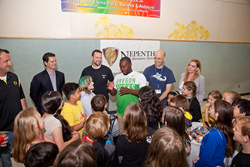 Nepenthe Laboratory Services (NLS) hosts Citizenship Assembly at Riverbend Elementary School with guest speakers Kenny Wheaton and C.W. Trisef to raise awareness for Red Nose Day & food for Lane County. Nepenthe Laboratory Services (NLS), a premier drug monitoring and toxicology laboratory, held a Citizenship Assembly at Riverbend Elementary School last week to raise non-perishable food item donations for Food for Lane County, and to help support awareness for the upcoming May 26th event “Red Nose Day” hosted on NBC. “The goal of the assembly was to create an exciting atmosphere for the kids at Riverbend to aspire community involvement and help charitable organizations whose visions align with Nepenthe’s core social components,” said Sarah Whitt, Marketing and Business Developer at NLS. The company asked the kids to donate two cans of food to Food for Lane County and wear a Red Nose provided by NLS. “The purpose of the kids wearing the nose is to have it captured and shared, to encourage donations to the fund, who aid young people in poverty conditions,” said Sarah Whitt. The Citizenship Assembly kicked off with guest speaker, C.W. Trisef, author of The Oracle Series, who uses his books to entertain, educate, and encourage literacy among youth. “We are very involved in the community. Perhaps our most noble aspiration is to constantly present at schools, performing assemblies and promoting higher literacy. We want to help communities …” the author sites on his Facebook account (/OracleSeries). Following the author’s presentation, was an impactful, short intermission of approximately 500 kids wearing red noses and chanting “Laugh. Give. Save a kid!” to welcome in their second guest, former University of Oregon defensive back, Kenny Wheaton. The kids received a powerful message from Mr. Wheaton to “Dream big and know that dreams do come true with hard work.” He shared his experience of the importance of hard work, overcoming obstacles, and committing yourself to a drug-free lifestyle, which he contributes to his success as a football player and hopes to inspire young individuals. An independent lab providing comprehensive pain management testing services throughout the U.S. from headquarters in Eugene, Oregon. Under the leadership and directorship of Brian Baumgartner, the lab is quickly building a reputation for not only its commitment to exceptional precision, but the relevancy and high-level analysis that only experienced physicians and medical specialists can offer.